John and Jayne Amos and Paul and Joanna Cobb are delighted to announce the merger of John Amos Property and Cobb Property. The two businesses will now be jointly trading as Cobb Amos. Cobb Property, based in Hereford city, formed in 2005 and quickly established a reputation for award winning customer service within the city and surrounding county. The Residential Sales team are complemented by a strong, qualified Residential Lettings Department, already managing over 400 properties. 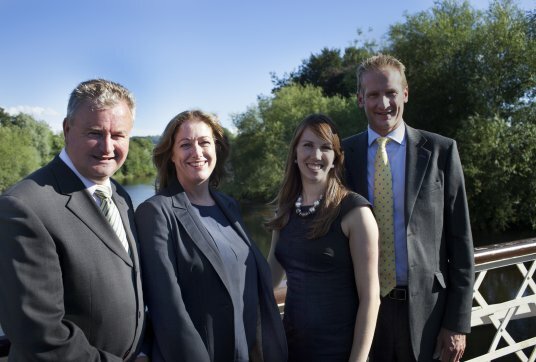 Formed in 2004 and currently trading from offices in Leominster and Knighton, John Amos Property Ltd has gained a strong reputation for rural and village property sales and auctions throughout Herefordshire, Shropshire and Wales. The amalgamation will further enhance market business and presence across the wider area and also ensure a marked strengthening for the region’s most successful Property Sales Auction department. “Cobb Amos is much more than a change in name,” says John Amos. “It’s a milestone in our joint companies’ desire to provide our clients with exceptional quality of service. We are determined to use this opportunity to continue building a stronger Estate and Lettings agency. Professionalism and expertise is at the forefront of the new Company from key staff members Joanna Cobb, Stephen Saunders, Tess Macleod and John Amos. Joanna is well known in the area, having spent over 15 years in the property business. Under her management, Cobb Property has won a string of awards and accolades.